← What Does CFD Body Language Look Like? The future of simulation driven product development resides in the cloud says the CEO of Hi Tech CAE because of the high demand to be placed on computing resources. 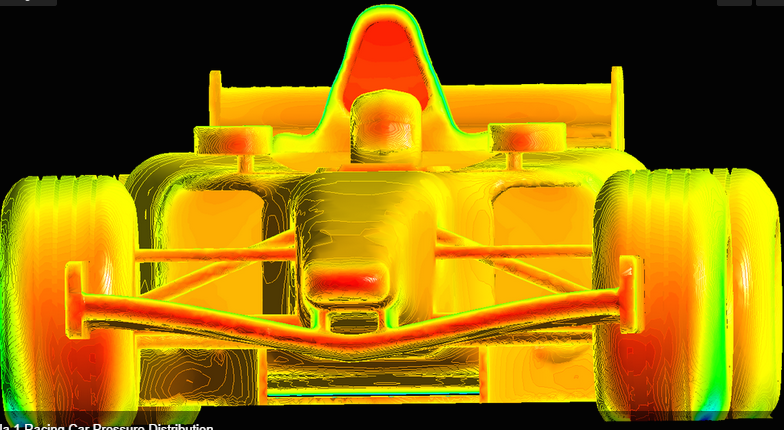 CFD solution for an F-1 race car from the CFD is the Future website. See link below. Version 0.3 of SpeedIT FLOW is now available. This RANS solver (appears to be based on OpenFOAM) runs entirely on the GPU. Rhino users can now generate NACA airfoils using the SeaHorse Foils plugin. Autodesk is currently testing Project Arro, a new tool for cleaning up CAD geometry so that it’s ready for simulation. 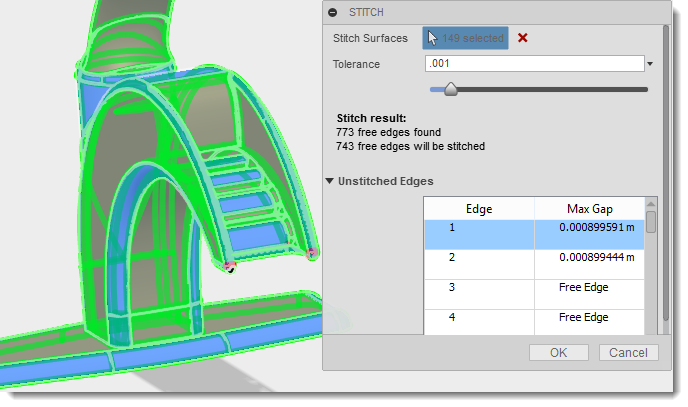 Preview of Autodesk’s Project Arro, specifically the stitch function for finding gaps in geometry. See link above. For those of you new to simulation (or CFD specifically), the article goes into detail on how to bring simulation into your organization. Here are the highlights [as paraphrased by me]. Start simple. Computing a time-dependent simulation of multiple moving bodies in reacting flow might not be the best “out of the box” test. Know what you want from the simulation. “Color pictures” is a valid answer, just not a good one. Stay narrowly focused on what you want to simulate. Train everyone on the simulation tools. They are not black boxes. Understand what your success criteria are. Know the limitations of your design and the tools. Validate, validate, validate. Can’t emphasize this enough. Running validation benchmarks is a great learning exercise and confidence builder. If you’re still interested even after reading the article, join me and ENGINEERING.com’s Shawn Wasserman next Tuesday, 16 September, at 2:00 p.m. eastern for a wide-ranging conversation about why It’s a Wonderful Time To Be Using CFD. I’m hoping CFD contributed to the design of Cummins-Peterbilt “supertruck” and its 10.7 miles per gallon fuel usage. Relative to less fuel efficient models, this vehicle would save around $27,000 per year in fuel costs and reduce emissions by over 40%. 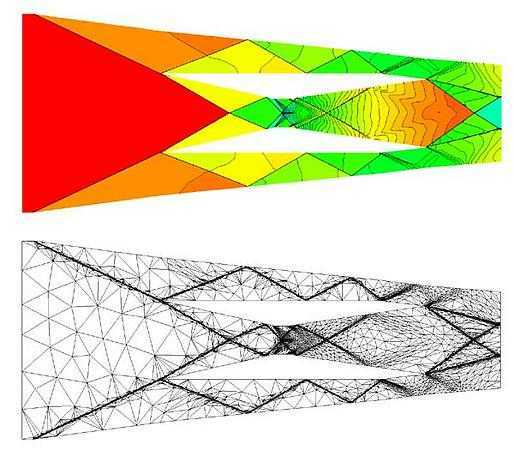 Experimental Database with Baseline CFD Solutions: 2-D and Axisymmetric Hypersonic Shock-Wave/Turbulent Boundary Layer Interactions. Improving stormwater systems using FLOW-3D. A good mesh sometimes looks not-so-good or so says LearnCAx. See link above. The Engineering Simulation Show will be held 15-16 April in Derby, UK. MSC says they’ve reinvented CAE and are hosting webinars in early October to tell us how. The next HPC User Forum will be in Seattle on 15-17 September 2014. CFD is the future, true enough. But it’s also the website of researcher Ahmed Al Makky. A valued reader (thank you) emailed me a link to the Systems Art blog and website, an online forum for exploring the use of systems theory for looking at extant works and creating new ones. I bet you can appreciate how systems theory can be applied to certain types of geometric abstractions: Mondrian, for example. Three excellent examples of Mondrian’s painting. Click image for source (a very nice article unto itself). But I suppose the works of Jackson Pollock might challenge any systematic attempts at understanding. However, on the Systems Art blog you can read about “random regularity” and how his paintings (and those of others) can be interpreted. This entry was posted in Applications, Events, Hardware, News, Software and tagged Autodesk, FLOW-3D, GPU, mesh generation, Pointwise, Project Arro, Rhino, SpeedIT Flow. Bookmark the permalink.